David Castro’s new book, Genership, promises to shake up a genre that has become very tired over the past 15 years. Most books in print on the subject of leadership or management offer an increasingly predictable blend of advice grounded in common sense, generally suggesting simple strategies for getting along well with others while achieving effectiveness as an executive. 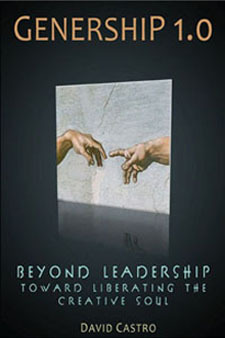 The prototypical example would be the late Dr. Steven Covey’s advice to “synergize” and “begin with the end in mind.” Leadership books also often lapse into a disconcerting kind of auto-hagiography in which successful leaders moralize while telling tall tales about their successes and glossing over their challenges, something like watching NBA highlights instead of real games. The tape always looks good when you edit out the air balls! Stars always overcome their challenges, and we too can succeed by learning to mimic their excellent practices. So the story goes. But Castro’s book does something courageous that we haven’t seen before in this genre: He questions the very concept of leadership itself, thinking through its limitations. “Imagine walking into the International Academy of Management and suggesting that management is an idea whose time has passed,” writes Castro. Indeed. This is a challenging and refreshing approach, akin to Galileo asking Ptolemy’s followers to swap the sun for the earth as the center of the solar system. Castro’s central thesis in Genership is that leadership practices have the potential to evolve into something better and stronger. His book describes this evolution and encourages it, inviting us to see the eagle waiting to emerge from a soon-to–be-extinct pterodactyl. Castro argues that today’s effective and evolved leadership—good leadership—is actually quite different from traditional leadership. It is so different, says Castro, that it deserves a new name. He suggests genership (jen’-er-ship), seeing it as the special skill of broadly enabling creativity within groups. Throughout the book, Castro invites us to think about the ways in which this community practice of creativity is central to human progress and even to human identity. As part of his case, Castro offers a potent critique of traditional leadership processes within organizations, introducing us to three fallacies: the messiah fallacy, the hero fallacy and the fallacy of leadership nostalgia. Castro’s criticism of traditional leadership merits patient review and reflection. He exposes something truly strange about modern organizational life: the way in which groups irrationally seek out a messianic leader, attempt to fix blame and responsibility on that person for all of the group’s problems and then wait for their messiah to fail and fall. Castro rightly suggests that the process of combat among heroic messianic contenders, along with our cultural obsession with seeking “the One” who can supposedly solve all of our problems, drives groups to absurd levels of ineffectiveness. Groups mired in such dynamics end up wasting enormous amounts of productive energy. Castro’s critique will open readers’ eyes to the ways in which such irrational thinking has become the norm in everyday organizational life. This unflinching assessment is provocative and timely. One need only think about the 2012 presidential election to see how a culture can become imprisoned within such fallacious thinking. In clearing the path for genership, Castro offers much more than a critique of traditional leadership practices. In a series of meaty chapters, he meditates on specific and interrelated organizational practices central to creativity within groups: Listening, CoThinking, CoVisioning, Relationships, Conflict and Learning, Systems Thinking, Creativity and Group Dynamics. In each arena, Castro employs potent examples to explore how traditional leadership can evolve into more powerful genership skills, delivering not the rote implementation of a messianic leader’s vision but rather the full engagement of communities in shared creative projects. Some of these passages tread ground that will be familiar to students learning organizational theory, which Castro acknowledges has informed his perspectives. This work, however, provides something profoundly new: an overarching idea—genership—that has the potential to change the conversation within organizations about the meaning and practice of leadership. If leadership does evolve into genership, as Castro advocates, there is no doubt that organizations around the world will change in ways that open significant new possibilities for human progress. Castro successfully situates genership within a greater philosophical and religious context. His thoughts about this, found in the preface and in the final chapter, are compelling. He first contends that human nature is fundamentally creative and that to participate in the divine power to create is the most important way in which humans exist in the image of their creator. In a world in which religion often seems to promise only submission to doctrine, Castro’s focus on human creativity as something spiritual is inspiring and motivating! Second, he says that our search for messianic leaders is really a form of idolatry that wisdom literature has warned against since the dawn of recorded time. No man is God. If there is only one God, it follows that all human leaders are fallible and imperfect. It would be helpful to remember this truth in working with real leaders in real organizations, says Castro. In that spirit, let me say that he does not pretend to be a messiah and his work is not perfect, and I am sure it would gratify him to hear me say so. The full title, Genership 1.0, points toward future editions. Castro is humbly inviting his audience to a dialogue and he understands that his ideas will change, develop and improve within the context of that dialogue. And that is exactly what he would want to happen. Read this book as a way of entering into this important conversation not as a mere spectator, but as a full participant in the development of a new way of leading called genership.